Coaches Karin, Veta and Noelle take a selfie at Little Bay, Montserrat. This is a story of how three women connected over their shared love of the water and teaching children to swim. 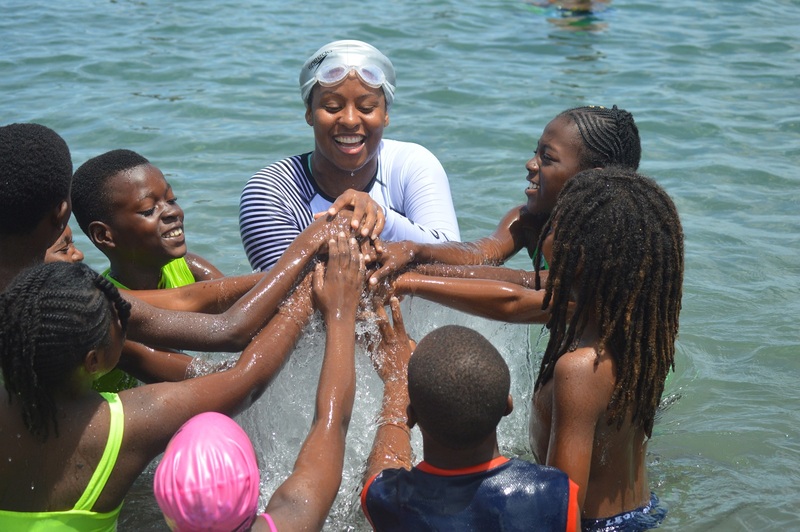 Veta Wade is one of Montserrat’s ocean conservation advocates and for the past four years, she has been helping the island’s children fall in love with the sea. Karin Clashing O’Reilly is an Antiguan swimmer who competed in the women’s 50m freestyle at the 2012 Summer Olympics in London. She is a founding member of the Wadadli Aquatic Racers (WAR) Swim Club and has been a swim coach with WAR for over 10 years. Noelle Singleton founded #AfroSwimmers in Atlanta, Georgia, where she helps people of colour get over their phobias and embrace swimming. 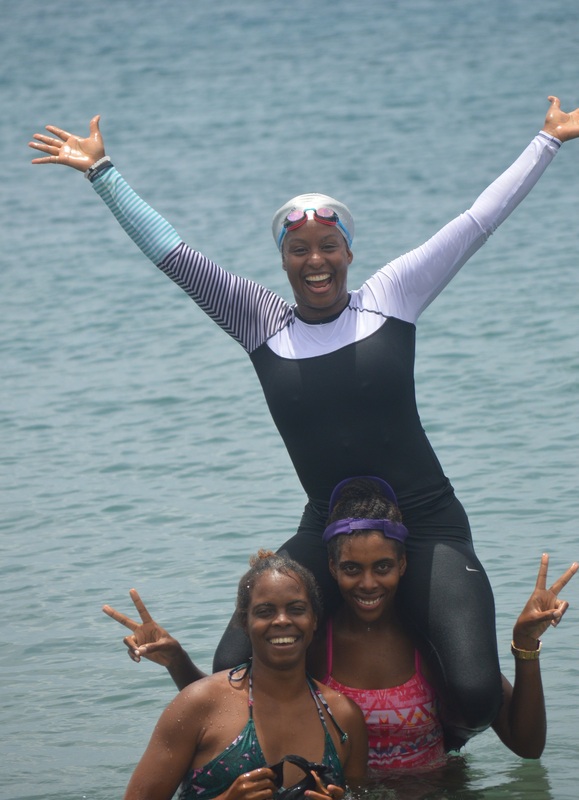 After connecting via social media, the three women met for the first time in person on Montserrat at Veta’s annual Fish’n Fins camp. You are as likely to see Noelle in the water with a swim cap or her big afro, and that is an essential part of the story she shares with people of colour. Through her #AfroSwimmers brand, she is helping to create a shift in how black people interact with aquatics. “As an afro-wearing swim coach I also teach students how to care for their hair and skin while swimming. It is one of the reasons why many people have stayed out of the water. They don’t know how to care for themselves.” She uses her social media accounts, especially on Instagram, to answer questions on moisturizing hair, dealing with skin conditions and helping parents support their children who are learning to swim. “We connect around #afroswimmers and I connect with coaches globally. That is how Veta found me. There are lots of powerful things hppening on the internet. There is a big shift now happening socially and culturally due to social media and the new generation is controlling the narrative. When they can’t find a product that they need, they are creating it. Now you have customised swim caps for people with afros and locs and any hair type. You can find what you need to participate in aquatics,” Coach Noelle shared. Karin Clashing O’Reilly was born in Costa Rica and first learned to swim in the ocean. Her older sister Christal competed in the 2004 Olympics in Athens in the 50m freestyle. This, along with Karin’s desire to compete in swimming spurred their mother to learn everything she could about coaching and to eventually launch the Wadadli Aquatic Racers Swim Club in 2006 on Antigua. Karin went on to compete in the 50m freestyle at the London Olympics in 2012, winning her heat but failing to advance to the next round. Now, she works with children as young as three and those who are on the cusp of transitioning to competitive swimming, with great results. The olympian revealed that she would often times be the only swimmer from Antigua & Barbuda in the early days of competition on other islands but now, they regularly fill their 35-person quota. In 2016, Antigua & Barbuda sent two swimmers to the Rio Olympics. Mutual connections in the watersports arena brought Karin and Veta together and it is a relationship they want to build on so more Montserratians will enjoy the ocean safely. “I learned to swim in the ocean and it gave me an appreciation and love for the sea,” said Karin, who also teaches music at the secondary school level at home. While on island, the three coaches have been working with children, including some who have had fears of the water and never learned to swim. They agree that is never gets old seeing children fall in love with the ocean. A major part of learning to enjoy the ocean is learning what lies beneath it and how to be safe in it. The campers have been searching for marine debris, learning about coal bleaching and other things that are harming the sea and sea creatures. They have also been able to enjoy kayaking, snorkeling and for the stronger swimmers lots of deep dives for plastics and other garbage. The women have also been taking the young swimmers through water safety and life rescue drills. Water phobias is one of the areas of expertise for Coach Noelle and she said it has been rewarding to see how the children have grown in confidence as they learn the right way to do things. “Phobias can develop over time or overnight. Anytime an emotion goes unvalidated and has not been thought through without a factual basis, it can turn into a phobia. So I have clients who have fears of pool drains can’t get water in their ears, gag reflex, and those who generationally have a fear of the water. You won’t allow your child to swim because you don’t know how to swim and because your parents never took you to swim. I understand that fear because you won’t take your children some place you can’t keep them safe. Parents have to say I want my kids to have more opportunities than I have so I am willing to rake a risk. “I can’t make their phobia go away. I can change the way they react to the fear. I teach them the skills to work with the fear. Over time they come to see that every battle starts in the mind. I validate their fears no matter or weird their phobia may sound. The fact is they have a coach they can trust and they are learning water safety skills they can use in their life,” she explained. Along with being black girls with afros, their teaching styles complement the other, as they recognise it is important that the new generation is equipped to lead and teach. The young volunteers which are assigned to groups of campers are all given opportunities to lead the classes to reinforce what everyone is learning. Veta understands that the work she has been able to do over the past four years has been because of the power of partnerships, such as the one with the Government of Montserrat’s Youth department, a co-sponsor of the camp. The contributions of The Waitt Institute, which launched the Blue Halo Montserrat initiative has also been a major supporter of the Fish ‘n Fins programme. Celebrate your successes publicly to help find those who are willing to champion your work and collaborate with you. Social media IS the most powerful way to find and connect with your tribe. Follow Coach Noelle on Instagram at – https://www.instagram.com/afroswimmers/ Use #afroswimmers to find out about diversity in aquatics.